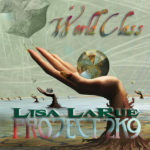 This is the latest CD album from distinguished Native American keyboardist / writer Lisa LaRue. It features a collaboration of up and coming prog artists and seasoned veterans and was an attempt to develop an idea between the musicians without too much central direction. It features Steve Adams (ARZ) and guest David Mark Pearce (Oliver Wakeman Band) on guitar, Chris Brown (Ghost Circus) on bass, Jo De Boeck (Beyond the Labyrinth), John Payne (Asia) and guest Claire Vezina on vocals, Svetian Racket on drums and Lisa LaRue herself on keys. “In Camera” starts the album off in a very slick pacing way with a lush synth intro into some haunting guitar. A nice scene setter. “Copper Edge” as the name suggests is much more edgy with some superb organ sounds and first class drumming. Very “fusion” it has that jazzy cross-over edge to it, but the classy production gave it a different feel. Personally I don’t like it when it’s too slick but this manages to retain the human feel. Superb guitar / keyboard interplay throughout this track and an unexpected ending, which keeps you on your toes. “Tell Me Why” comes in with vocals just when the album needed a vocal track. A very commercial song and perfect for a single. I personally didn’t like the vocals; they sounded a bit too over sincere, but that’s just my opinion. “Kituwa” is a gem though. Perfect guitar / keyboard interplay and superb drums and bass accompaniment. This was a lovely journey through many prog epochs and genres. Fantastic! Worth buying just for this track. “Deluge” has a Spanish theme throughout which works perfectly. The vocals are perhaps a little over sensitive, but that’s down to personal preference. “There Are No Words” again has a Spanish theme with some wonderfully sensitive guitar playing accompanied with some superb keyboards. Another beautiful piece of music. “For Eternity” has a much more understated vocal but again it seems to hold the music back. It’s like as soon as the vocals come in everyone starts staring at their shoes and all the previous skill and craftsmanship seems to leave them. They should be combining the vocals with the many varied and interesting musical sounds in a much more cohesive way. “Beautiful Illusion” the band is back at its best. Great riff / chord ideas and good development. The vocal is much more bedded in and doesn’t overpower the music as earlier songs have. “For Our Love”. I stand corrected! Great song, and extremely well sung. There you go, I know nothing! “Two AM” was a bit of a studio idea. Yes! The bonus track “Save Me” ended a great album very adequately. Good song and good vocals, perhaps not the best track but a good ending nevertheless. Project 2K9 has a great, skilled band with some superb writing and development of themes. Combined with some very slick production, but not too slick so as to sterilize everything, which happens far too much these days. “Kituwa” and “There Are No Words” are world-class classic prog pieces, and while I was a bit harsh with the vocals you may absolutely love the singing. It’s all down to personal taste. Great album from a superb musician and guest musicians.